Like most smartphones, mine can always use a little extra juice. By the time I arrive at a pub or restaurant for an evening drink or meal, my little battery icon is well below the halfway point. And, of course, I don’t have a charging cable and there’s no power outlet nearby. But there would be if the table included a set of Circle coasters instead of cardboard disks sports a beer logo. The Circle is an elegantly engraved wooden disk that has a charging cable nestled inside it’s outer rim. While the coaster collects condensation from your glass, the cable recharges your iPhone or Android device. The Circle is the creation of ChefCherger, a Boston-based and MIT-affiliated collection of inventors and thinkers. The crew is currently raising production funds with a Kickstarter campaign that aims at collecting $45,000 over the next four weeks. 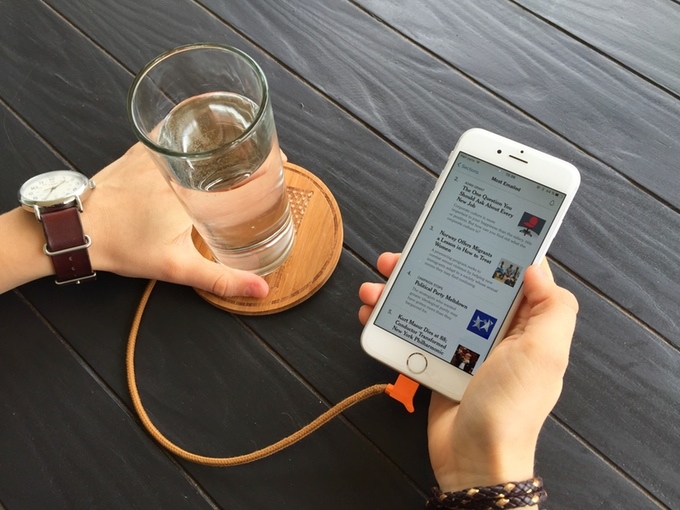 Backers who pledge $80 will get three circles with cables of their choice (iPhone or Android) and wooden charging cradle. Backers who spend a little more can have the coasters customized with text or an image. The Circle is scheduled to be available in March, 2016.